Welcome to the home of Kawai acoustic and digital pianos in the United States and Canada. Over the past eighty years, Kawai has earned a reputation for outstanding quality and workmanship in the crafting of world-class musical instruments. As a result, Kawai pianos and digital pianos have become the instruments of choice for pianists, teachers, churches, students and piano enthusiasts around the globe. Building upon the legacy of company founder, Koichi Kawai, the people of Kawai have dedicated themselves to a singular pursuit—to transform the future of the piano by skillfully blending the precepts of traditional piano craftsmanship with the latest available technologies and materials. This never-ending quest for perfection, now led by the third generation of Kawai family leadership, has brought about the finest selection of grand pianos, upright pianos, digital pianos and professional stage pianos available today. We invite you to explore our collection of world-renowned instruments—from luxury grands to elegant uprights to ground-breaking digitals. Unlike most manufacturers, Yamaha takes a total approach to piano making: it retains complete control over virtually every component at every stage of production, even to the point of building the manufacturing equipment. 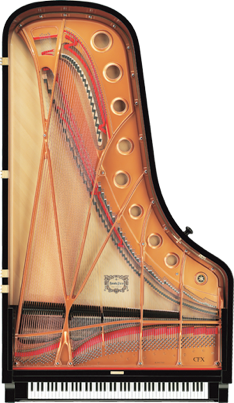 Rather than assembling pianos from parts produced by outside companies or contracting with third parties to build its pianos, Yamaha designs, tests, evaluates and manufactures all major components by. Another key advantage to Yamaha is the extent of the company's expertise in related technologies. With well-established credentials in fields such as metallurgy, chemistry and electronics as well as more obvious areas like acoustics and woodworking Yamaha leverages extensive internal resources to raise the standards of piano-making. The results of this inter-disciplinary approach are a steady stream of innovations and better musical instruments. Yamaha Grand Pianos are considered by professional musicians to be among the best in the world. The list is a mile long, but to name just a few, Artist’s like: Chick Corea, Sara Bareilles, Brandi Carlile, David Foster, Josh Groban, Elton John, Nora Jones, Alicia Keys, John Legend, Michael McDonald, Paul McCartney, Phil Vassar, Rufus Wainwright, Michael Tilson Thomas… All perform exclusively on Yamaha Grand Pianos.